"Ah, I guess they didn't tell you that the burgers came with fries when you ordered" says our waiter, as he puts down the fourth plate of fries on our table — a table for just the two of us. He's right, they didn't tell us that, and so we find ourselves knee-deep in two kinds of fries across four plates, passing a summer evening toeing the line between pleasantly satisfied and roll-me-back-to-the-tube-station full. ALL the fries. We did not eat them all. 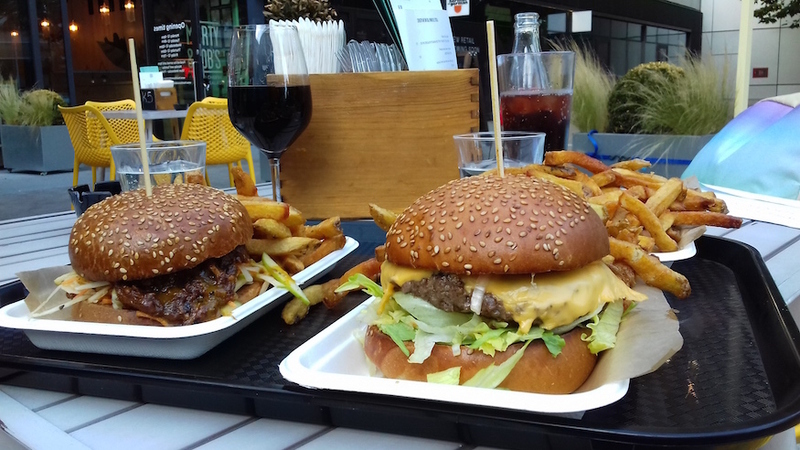 The current kitchen residency at Feast Bar & Kitchen is Morty and Bob's, the street food stall best known for its grilled cheese sandwiches. They're on the menu, along with burgers, a fish version of a hot dog, and a couple of other bits and pieces. The online menu varies from the one available on our visit, and it's not a hugely varied list, but the choices are sufficient to accompany a pint or two — because first and foremost, Feast is a bar. The drinks menu is impressive, covering everything from beers and fruity ciders to wines from all over the world, via cocktails and shots. Even those on the soft drinks have a decent choice, for once. Although only a 10 minute walk from the chaos of Westfield, it feels a whole world away. At the end of the pedestrianised White City Place, Feast isn't graced with much passing traffic. Yet it's got the atmosphere bang on. The outside area has its own bar, and is adorned with fairy lights, while indoors, long, high bar tables and booths fill the large space. Having to order at two different places — drinks at the bar and food at the kitchen hatch — isn't a problem on a quiet evening, but we can imagine it getting quite hectic on a busier day. The parmesan truffle fries are the highlight of the meal. As for that mountain of food, it's a mixed bunch. The rosemary salt fries have a subtle taste, which needs a dabble of garlic mayo to bring it out. 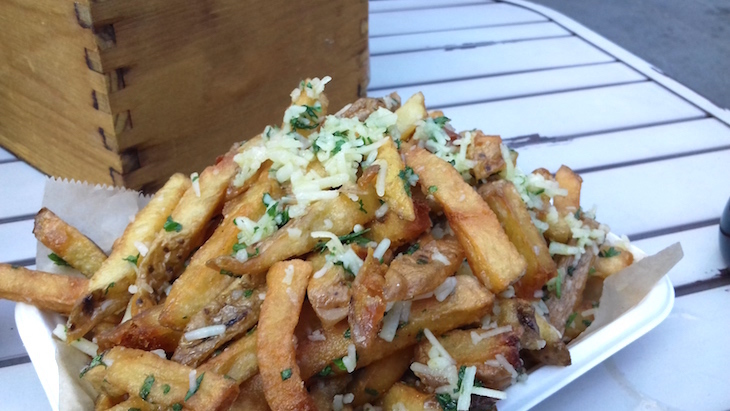 The parmesan truffle fries work well on their own, offering a rich, almost creamy accompaniment to the mains. The pulled pork burger is rich in flavour and a messy but a satisfying, grease-running-down-your-arms eat. The Bob's Burger is... well, it's a burger. It does exactly what it should, but does nothing to stand out from the crowd. The sesame bun puts us in mind of a certain fast food chain, and while it's palatable, we're not in a hurry to order it again. We'll be back here for summer drinks, though. 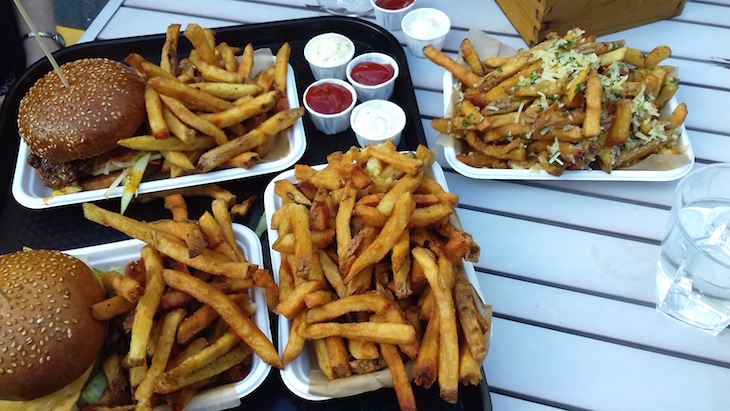 And no, we couldn't eat all of those fries. Feast Bar & Kitchen, 201 Wood Lane, White City Place, Shepherd's Bush, W12 7TU.